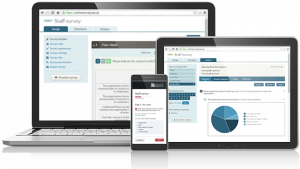 The online survey tool designed for Academic Research, Education and Public Sector organisations. Easy to use, no set-up required. Fully compliant with all UK data protection laws. Enables collaborative working and benchmarking across multiple organisations. Fully featured free 30 day demo account. Further education and alternative providers can get fully discounted access for one year for their whole organisation when they sign up before the 31 July 2019, as part of their www.jisc.ac.uk subscription. Please contact help@jisc.ac.uk to find out more. Online surveys (formerly BOS) is a powerful, easy to use tool for creating online surveys. Run by Jisc, online surveys is used by over 300 different organisations in the UK and internationally. Find out more about online surveys.